#25 UB beat Akron 76-70 Tuesday night to improve to 21-3 on the season. AKRON, Ohio — AKRON, Ohio (AP) - CJ Massinburg scored 21 points, Dontay Caruthers added 15 and No. 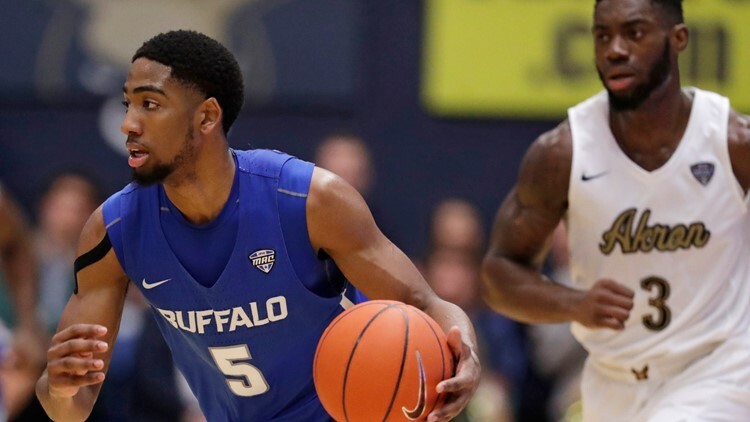 25 Buffalo turned up its defensive intensity in the second half and held on to beat Akron 76-70 on Tuesday night, dropping the Zips to 0-31 against ranked teams. Akron fouled Massinburg on the inbounds pass and the senior guard made the first free throw but missed the second. However, Caruthers alertly grabbed the offensive rebound and dropped a layup for the final bucket. Buffalo was just the fifth ranked opponent to visit Akron's James A. Rhodes Arena and the first since No. 20 Nevada in 2006-07. Although they've had several close calls, the Zips have never beaten a Top 25 team. The well-balanced Bulls, whose three losses have all come on the road, came in as one of the country's top scoring teams, averaging 85 points per game. But the Bulls had to work for every basket and didn't open a double-digit lead until the second half when Jordan's corner 3-pointer gave the Western New Yorkers a 47-36 lead. Jackson kept the Zips within range with a pair of 3-pointers and a long shot by Ivey pull Akron within 62-58. But Massinburg made two free throws after a ticky-tack foul was called on Akron and the senior guard drove for layup to give Buffalo a 66-58 lead with 2:43 left. Massinburg, who didn't score in the first half of Buffalo's win over Central Michigan on Saturday, was scoreless for the first 14:34 before making a layup and 3-pointer to help the Bulls take a 30-28 lead at halftime. It matched a season-low in the opening 20 minutes for Buffalo, which couldn't get anything in transition against the Zips, who fell to 11-2 at home. Buffalo has won at least 20 games in four of the past five seasons. Before 2014-15, the Bulls had just three 20-win seasons. Buffalo's Jeenathan Williams was called for a technical foul in the first half, when he buried a 3-pointer and then barked at Akron's bench. Moments later, Zips coach John Groce got slapped with a "T'' for expressing his difference of opinion with the officials over a call.